You never quite know what sort of reception you might get when you wander into an artist’s studio on a quiet Friday afternoon. Will they be hard at work? Will I be disturbing them? Will they be too lost in thought to chat to me? No such worries here when I popped into Old Leigh Studios in Leigh-on-Sea last week. I was immediately warmly greeted by ceramicist Richard Baxter and he introduced me to fellow potter and studio-mate Julie O’Sullivan. Their wares are elegantly displayed throughout the shop partition of the studio alongside paintings by two other studio residents Sheila Appleton and Ian E Smith. It turns out Richard is a little bit of a local legend in art circles: he started the Leigh Art Trail in 1997 and it quickly became an annual fixture. It’s now a week-long celebration held every June and features local as well as not-so-local creative talent. 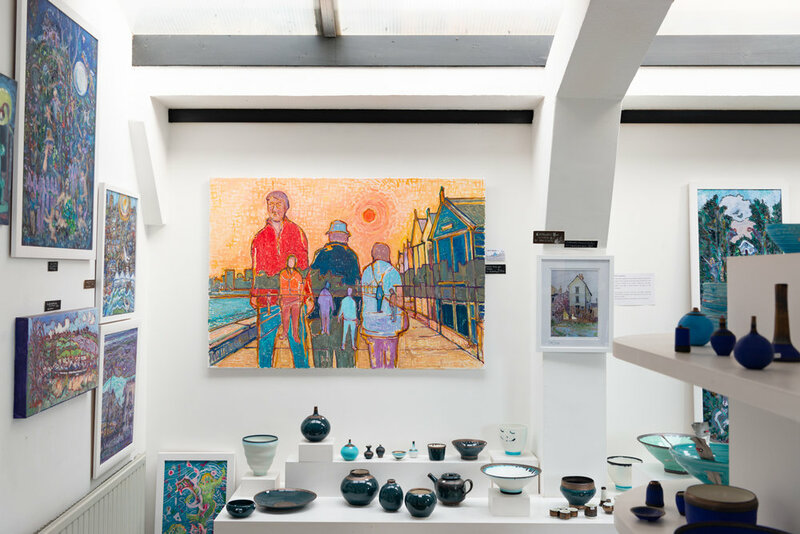 As the name suggests, it consists of an exhibition trail that takes you all around Leigh-on-Sea with many local shops and spaces becoming pop-up galleries for the week. His artwork is described on his website as “reminiscent of Scandinavian mid-century modern ceramics”, and they’re also fun, brightly coloured, bold and endlessly unique. I definitely wanted to take one home. I fell in love with Julie’s ceramics. She melts little pieces of beach glass into the clay which dictates a more nature-inspired colour palette. I told her about my trip to the nineteenth-century landfill site near Tilbury and she knew about it; she’d already been! Some of these pieces of glass were from that very site. I’m sure I don’t need another little ceramic dish in my house but, oh my word, these are on my wish list. There was one collection Richard and Julie had worked on together and it was a commission for nearby restaurant Food by John Lawson. In the restauranteur’s quest to procure as much as he could from local sources, he sought out unique bespoke designs for the crockery. Together they created a nature inspired range of hand-thrown plates, cups and sauce pots. They, of course, made a surplus and you can buy them in their shop.